Despite of the rising price of international crude oil and decline in value of U.S. dollar, Korean stock market remained relatively stable in November without any big fall or rise influenced by the gain in U.S. markets and the foreign buying. The industries, such as the medical supplies, non-metallic mineral, iron & metal and transport & storage, advanced, while other industries such as the transportation equipment, electricity & gas, construction, communication and insurance, declined. Among the large-cap stocks, the issues such as the Samsung Electronics, POSCO and LG Philips LCD, rose, while other issues such as the SK Telecom, KEPCO, KT, LG Electronics and Shinhan Holdings, fell. Among favorable factors in the month was U.S. market rally in spite of the weak U.S. dollar and higher crude oil price plus the highest-ever Euro/USD rate. Satisfactory performance of pension fund's stock investment with average return ratio of net buying top 50 issues since August standing at 28 percent has also served as favorable factor for local stock market. The Financial Times, in the meantime, has pointed out in an article possible assault by "hot money" if the exchange rate is not defended properly. 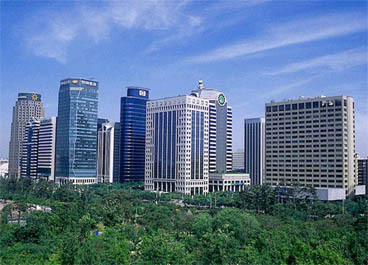 Against this backdrop, the Ministry of Finance asked Korean businesses to refrain from selling their dollars while underscoring the need for protection of local currency against weakening dollar. Among other news affecting the stock market in November include China's plan to raise interest rate by minimum of 0.25 percent and maximum of 2.0 percent in 2005. 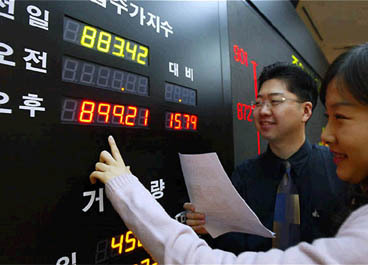 The Financial Supervisory Service (FSS) reported that the size of the local financial market, consisting of savings, loans, stocks, bonds, insurance and other capital, grew by 51.7 percent to 3,141 trillion won ($2,991 billion) as of June 2004 from 2,070 trillion won in 2000. However, the financial market displayed a marked slowdown in growth rate over the past four and a half years as it expanded by only 4.1 percent as of last June from the previous year, after growing 10 percent to 3,018 trillion won in 2003, 14.1 percent to 2,744 trillion won in 2002, and 16.2 percent to 2,406 trillion won in 2001. 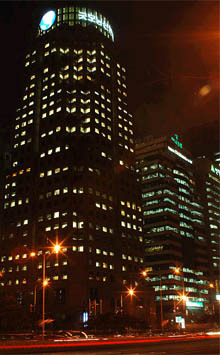 As the domestic interest rate continued to slide for the last several years, the savings held by local financial services companies, such as commercial and savings banks, increased by only 3.2 percent to 1,030 trillion won last June from a year ago after expanding 6.6 percent in 2003 and 15 percent growth in 2002. The local stock market displayed a significantly high level of uncertainty for the last several years as the market fluctuated widely year after year, with a negative growth of 3.3 percent in June this year from last year, after growing 32.8 percent in 2003 over 2002. "The local stock market has shown an extremely unstable trend over the years since the market tends to move up and down in line with short-term economic indicators such as the rise and fall of interest rates," FSS officials said. The won's gain against the U.S. dollar is expected to have a negative impact on the nation's shipbuilders, automakers and electronics goods manufacturers as their earnings may decline significantly next year if the currency continues to rise, Daewoo Securities said. The local brokerage firm said that the impact of a strengthening won would be felt most by companies in the shipping, electronics and auto sectors as exports account for a large share of their revenue. "According to the Bank of Korea, shipbuilders get over 81 percent of their sales from net exports, or exports minus imports, electronics goods makers get 21 percent and car manufacturers generate 20 percent of their sales from net exports," Lee Won-sun, an analyst at Daewoo, said in a report. "From the 35 listed companies tracked by Daewoo that are most likely to be sensitive to currency fluctuations, we believe that a 100 won gain by the local currency would reduce their combined net profit by 4.2 percent next year," Lee noted. Lee expected operating profit would fall by 10.1 percent if the average won-dollar exchange rate falls to 960 won in 2005. Daewoo forecast next year's won would average 1,060 won versus the greenback, with 1,040 won at the end of 2005. It said that Hyundai Motor, the nation's largest carmaker, could see its net profits slump more than 8 percent next year if the dollar weakened to 960 won. For Samsung Electronics, it forecast that the net income of the world's largest computer memory chipmaker could tumble by 17 percent to 7.8 trillion won. Other firms likely to see a decline in profits at the 960 level for the won included Hynix Semiconductor, LG Electronics, Samsung SDI and LG.Philips LCD. Dongwon Securities also said that a 10 percent gain in the value of the won could reduce the won-denominated operating profit of Korea's manufacturers by 2 percent. "The shipping and auto industries are likely to suffer the biggest drop in operating profits with about 5 percent. The machinery and electronics sectors could see a fall of 2.5 percent and 3 percent," the broker said in a report. "A stronger won may not affect the actual size of total sales, but the value of earnings would decline when converted into local currency," he added. Samsung Securities said that a prolonged period of a strong won would benefit companies in the telecommunications and oil refining industries, while shipbuilders and automakers may rebound if the won slows its gain against the dollar and stabilizes. "In the past month, the benchmark stock index has risen by about 2.6 percent while the won has risen by 7 percent. Companies that outperformed the index were those in the utilities and telecommunications sectors such as KEPCO, SK Telecom and KT. But those that performed worse than the index were in the shipping, IT and auto sectors," Oh Hyun-Seok, an analyst at Samsung, said. Samsung forecast that the short-term barrier of the won would be 1,050 won. Daewoo said paper manufacturers, chemical firms, electricity and gas firms may actually benefit from the won's strength as they depend more on imports than exports. It forecast that net profit would jump by 186 percent for Korea Air and 67 percent for Asiana Airlines if the won-dollar rate dropped to 960 won as they depend on fuel imports and have large dollar-denominated overseas debts. Other firms to see a growth in earnings on a stronger won included Hansol Paper, KEPCO, CJ and KT, Daewoo said. In the meantime,more Korean blue-chip companies are exposed to hostile takeover bids by foreign capital. A case in point is the SK Group. The nation's third largest conglomerate with combined asset value of more than 50 trillion won is being swayed by Sovereign Asset Management, a Monaco-based investment fund, which became a major shareholder of the group's de factor holding company, SK Corp., with just the investment of 170 billion won. The main reason: Korean chaebol's shady and shaky corporate governance structure and the government's tight regulation of these family-controlled groups. Sovereign has already raked in 1 trillion won in appraisal profits from dividends and stock price increases. It still wants to oust SK Corp. Chairman, Chey Tae-won, who actually controls the entire group, for his criminal record due to accounting fraud. It is not certain whether Sovereign's ultimate intention is an M&A or maximizing its investment income by keeping the oil-telecom group at bay. But the general consensus among local analysts seems to be "enough is enough." The problem is that SK's case may be just the beginning. Foreign shareholders account for more than 50 percent of equity stakes at 10 of the 20 biggest Korean companies, including not just POSCO and Kookmin Bank but Samsung Electronics and Hyundai Motor. This is the result of hastily opening financial markets before domestic businesses could even rectify their corporate governance problems, as well as a blind attempt to attract foreign capital in the wake of the 1997-98 currency crisis. Foreign funds can help enhance the financial health and managerial transparency of domestic firms. But the hedge funds should no longer be allowed to seek excessive profits or threaten managerial control of domestic businesses by capitalizing on their structural weaknesses. The role of a shark in an aquarium is to keep other fish fresh and attentive and not to prey upon them. Many Koreans love to hate chaebol for their greedy practices but don't want to hand them over to foreigners. That is why Korean government is considering introducing various defensive devices against hostile takeover bids, such as discriminatory voting rights for large shareholders and poison pills, as is the case in the United States and Europe. If needed, it could delay the introduction of a chaebol-reform bill that calls for limiting their total amount of investment in affiliates as well as voting rights in financial subsidiaries. Chaebol for their part should reform themselves and not ride on xenophobic sentiments. Korean firms are also busy mapping out strategies to defend management from possible foreign corporate raiders. Through the Federation of Korean Industries and other business organizations, they urged the government to revise the law and take out any loopholes that foreign raiders may exploit to take over blue-chip companies. As part of countermeasures against Sovereign, SK Corp. has improved corporate governance and financial health, while preparing for possible legal action from Sovereign to oust Chey. Samsung Electronics, the flagship affiliate of Samsung Group, has claimed it is also exposed to a hostile merger and acquisition (M&A) threat. Foreigners currently own 63.8 percent stakes in Samsung Electronics. Samsung Chairman Lee Kun-hee and his shareholders control 23.4 percent of Samsung Electronics' stake. In addition to Samsung Electronics, Samsung Corp., de facto holding company of Samsung Group, is not free from M&A threats, as its foreign shareholdings once nearly approached 50 percent. This is why Samsung has made group-level efforts to drop the FTC's revision bill, stressing the nation's biggest conglomerate may fall prey to a hostile M&A by foreign investors. Samsung Corp. is also strengthening investor relations (IR) activities overseas and improving transparency in management in a bid to secure trust of inventors. Hyundai Merchant Marine (HMM), the nation's second largest shipping company, has been on alert over a possible hostile M&A scheme by foreign investors as well, with foreign shares surging to 44 percent as of Oct. 8, more than double from 18.15 percent at the end of last year. Hutchison Whampoa holds 10 percent stakes in HMM, making it the second largest shareholder in the company after Hyundai Elevator with a 15.16-percent stake. Currently, Stavanger Fondsforvaltning, a Norwegian fund, aggressively raised its stake in HMM to 6.39 percent. The fund is 100 percent owned by Golar LNG, whose chairman and president John Fredriksen is known for M&As. HMM closely monitors investment patterns of foreigners to figure out the motive of their stock purchasing. The company secured 30 percent stakes but seeks to add more shares to protect current ownership. The ownership protection issue appeared at Hyundai Motor Company, whose foreign shareholding reaches 56 percent, as U.S.-based asset management firm Capital Group has recently increased its shares in Hyundai to 10.7 percent. Hyundai Motor said it confirmed Capital Group's acquisition of Hyundai stakes is aimed at gaining profits from investment, not targeting its ownership. "However, company management pays attention to a major foreign shareholder having more than 10 percent stake in the company. It will seek to secure as many company shares as they can get within its budget, in the case of a hostile M&A scheme by foreign investors," a company official said.